← Coming This Week: Birthday Week! 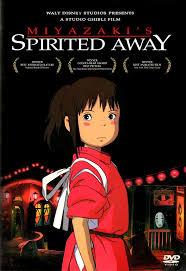 Hayao Miyazaki’s Spirited Away is often sited as a study in the transition from childhood to adulthood. In this respect, the criticism is well-founded: throughout our story, Chihiro/Sen (voiced by Daveigh Chase) transitions from whiny child to self-confident, mature young lady, and her metamorphsis is a joy to watch. 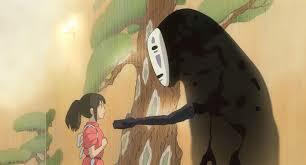 However, I’d be remiss if I didn’t point out that Spirited Away isn’t entirely about Chihiro; rather, it emphasizes those around her just as much, from communal acceptance to the support they provide her in order to meet her goals. This takes the meaning of the film in a different direction rather than a coming-of-age story: Chihiro needs to accept the support of her community in order to fully succeed, making her personal growth and development indicative of the need to belong to a society. When the film first starts off, Chihiro is dependent upon others to the point of being too scared to do anything on her own, and with good reason. Chihiro must be dependent on others because she’s in a position that is not yet ready to be completely self-reliant. She’s understandably upset at the prospect of moving: she has to abandon her old life, and for a child, that’s exceedingly difficult because her ability to escape (whether it’s a drive, a trip to the store, or going to the movies) is severely limited by whether or not her parents can accomodate her. In this sense, she’s stuck with just them, and that explains her terror when her parents first go missing: they are all that she has in the world, and they’re suddenly gone. Even adults struggle with the absence of a parent. 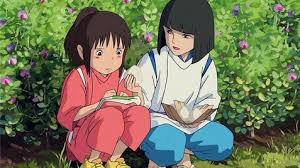 With her parents gone, Chihiro must find someone else to care for her, and so this leads her to rely upon Haku (Jason Marsden, who had the perfect voice for this role) and Kamajii (David Ogden-Stiers). Haku assists her in literally existing: he has to feed her some food of the spirit world to prevent her from disappearing. After that, he directs her to Kamajii, who has the power to help her secure work. Make no mistake: without the help of either of these two characters, our story would end. She needs these people in order to survive; she simply cannot do this on her own because she lacks the know how to navigate the spirit world. It’s when Chihiro, as Sen, is accepted into the community of the bathhouse that she truly demonstrates the growth necessary to becoming a fully-functioning individual. Make no mistake, Chihiro does not accomplish her goals entirely on her own, which means that she still needs others in order to succeed. Kamajii vouches for her to get a job from Yubaba (Suzanne Phleshette). Lin (Susan Egan) has to show her how to perform the physical labor necessary to avoid beatings and starvation in the bathhouse. No Face gives her the bath tokens she requires when the Foreman refuses to offer her service in an odd type of racism. However, it’s the way that Sen accepts this assistance that helps her find her voice. She has to prove that she’s willing to help the enchanted soot carry its coal as a demonstration of her committment to finishing something she starts. She continually asks for a job from Yubaba and obtains one, refusing to cry even though she’s scared. She asks Lin for clarification on her duties and is rewarded with kind words and offers of help, ranging from obtaining food to helping her with the River Spirit. In fact, the River Spirit brings me to the perfect symbolism of her acceptance: at first given the most unsavory job, she is then aided by everyone and lauded for her efforts. It’s her determination and professionalism that mark her as dedicated, which brings riches to all. Sen proves herself to be an asset, and as such, she is accepted and more readily assisted in her journey, from the rest of the bathhouse employees to Kamajii to Lin. And as more time passes, she is able to gain the confidence to stand on her own when she needs to, such as refusing to give in to No Face during his massive eating binge, or standing up to Boh (Tara Strong) when she desperately needed to help Haku. Sense of self is greater than sweet moolah. In order to become stronger, Chihiro needed to undergo a transformation of the self that included her assimiliation into society to forge something stronger that was already in herself. If you look at the character structure of Chihiro (荻野 千尋), you’ll notice that it contains the character for Sen (千), which means that the basis for her stronger, more confident identity was within her all along. However, it needed a catalyst in order to come out, and this catalyst was the communal acceptance of her by others. Chihiro couldn’t raise herself, especially not with parents that were more focused on their own wants (new job, the need to overeat) and unreliable methods of compensation (e.g., her father’s insistence that he could use cash and credit cards to square up his food bill). At first, Chihiro clung to those that wanted to help her (her parents, Haku), but then, she had to make situational decisions that caused her to step outside of that comfort zone. In reward for reaching a new milestone, she was rewarded with friendships and further assistance. This allowed her to go further and further each time until she became the assured character that stood up to Boh’s physical threats. In a defining moment, Sen tells Boh of his refusal to leave, “Staying in here will make you sick!” Boh represents the dangers of pacification and isolation: he’s afraid of germs in the outside world, which makes him terribly lonely, and he warns that if he doesn’t get his way, he’ll cry and his mother will kill Sen. Sen steadfastly refuses to cave to the demands, and instead winds up bringing him on an adventure that proves that he can stand up to his mother as well. Thus the transformation is complete: she is able to show someone else that if he goes outside of his comfort zone and makes an effort to engage with others rather than demanding that they come to him, he will be rewarded with rich friendships. Sometimes, you have to accept the help that’s offered willingly. During a moment of uncertainty and fear, Zeniba comforts Sen with the gift of a magic hairtie, telling her, “It will protect you. It’s made from the threads your friends wove together.” A brief line, but a rather moving metaphor for the theme of the film: let others in. Let them help you find yourself. Don’t be afraid to ask for help when you need it rather than demand that others do the heavy lifting right away. And above all else, know that where there are friends, you will always be safe.